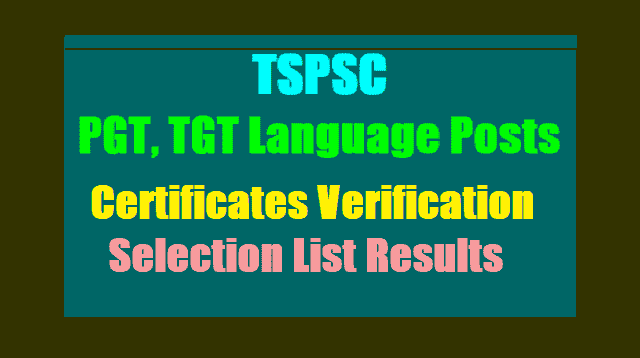 TSPSC TGT Telugu Selected Candidates list Results 2018 /TSPSC TGT Telugu Language Final Selection list Results 2018: TSPSC TGT Telugu, Urdu, English, Hindi Languages Final Selection list Results/ TSPSC TGT Telugu, Urdu Language Posts Selection List Results 2017: On the basis of the Main Examination held on 03/09/2017 (Telugu) and subsequent Certificate Verification process held on 27/11/2017,28/11/2017 and 29/11/2017 at Sankethika Vidya Bhavan, Masab Tank, Hyderabad and on 14/03/2018 at TSPSC Office, Nampally, Hyderabad for Direct Recruitment (General) to the post of Trained Graduate Teachers(Telugu) in various Residential Educational Institutions Societies, 609 candidates with the following Hall Ticket Numbers have been provisionally selected for appointment to the post of Trained Graduate Teachers (Telugu) in various Residential Educational Institutions Societies Notification No.14/2017, Dt: 14/04/2017. With this Notification of selection, the General Recruitment process notified vide Notification No.14/2017 for the post of Trained Graduate Teachers (Hindi & English) in various Residential Educational Institutions Societies has been finally concluded except PH vacancies. Dt: 14/04/2017. Against total 196 vacancies notified, 77 posts are not filled for want of eligible candidates in certain categories . However, the results of the PH candidates will be declared later. The selections are published here-with subject to the following conditions. notified vide Notification No.14/2017 for the post of Trained Graduate Teachers (URDU) in various Residential Educational Institutions Societies has been finally concluded except for PH vacancies The selections are subject to the final outcome of W.P.s and other cases pending, if any, before the Hon’ble High Courts of law. Notification No. 14/2017, Dt: 14/04/2017. However, the results of the PH candidates will be declared later. The selections are published here-with subject to the following conditions. Note: The candidates who are selected for the post of TGT (Telugu) are requested to relinquish their claim for other subjects of TGT posts, so that the Commission can select any other candidate as per 6-A of TSPSC Rules of Procedure. The relinquishment form is provided with this Selection Notification vide web link which will be available up to 24/04/2018 on website www.tspsc.gov.in. The selections are subject to the final outcome of W.P.s and other cases pending, if any, before the Hon’ble High Courts of law.